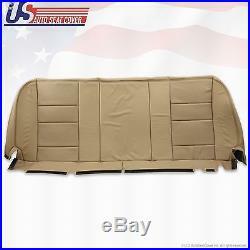 2002 to 2007 Ford F250 F350 Lariat Rear Bench Seat Bottom Replacement Leather Seat Cover in TAN. Also available in "Gray" & Black. This item is a new Custom-made. OEM replacement in Medium Parchment "Tan" color for. 2002 Ford F-250 and F-350 Lariat crew cabs. 2003 Ford F-250 and F-350 Lariat crew cabs. 2004 Ford F-250 and F-350 Lariat crew cabs. 2005 Ford F-250 and F-350 Lariat crew cabs. 2006 Ford F-250 and F-350 Lariat crew cabs. 2007 Ford F-250 and F-350 Lariat crew cabs. Seat cover, built to factory specs with. To match the Interior of your vehicle! The Center piece is Perforated leather and the rest are vinyl. Our product is exactly the same as your existing original cover and guaranteed to fit perfectly on your seat foam Pad. Any wrinkles seen in the pictures is from being in a box and guaranteed to disappear once installed Correctly. Please note this item is a. Not a slip on or pull over. Foam pad and frame are not included. The boxing/skirting is vinyl and center is Perforated Leather sewn onto foam. Just call or Check out my other items for more info. Be sure to add me to your favorites list. We are open 7 days a week from 7:30am-8:30pm central time. Please check our other listing if you'r looking for. Passenger Side Replacement Armrest Cover. Driver Side Replacement Armrest Cover. Passenger Side Bottom Replacement Leather Seat Cover. Driver Side Bottom Replacement Leather Seat Cove. Passenger Side Lean Back (Top) Replacement Leather Seat Cover. Driver Side Lean Back (Top) Replacement Leather Seat Cover. If you have any questions or concerns, just give us a call. There are several different power options available depending on your model and trim, therefore we do not pre-cut any holes for these options. These cuts are to be made at the time of installation. It doesn't have to be a perfect cut, since the power panel will cover it, you always go with a small hole then trim it out until the power control panel fits in the frame. Video installation available upon request. Leather Seat Covers vs Vinyl. Leather breathes so it stays cool in summer and warm in winter vinyl does not breathe and is cold in winter and hot in summer. In the cold, vinyl gets hard and stiff. Leather stays soft and supple. Leather is very strong and durable, lasting Many years. Vinyl is much more prone to cracks than leather. Even the best vinyl material shows damage faster than good quality leather. Leather will breath much easier, will not get sticky on a hot day like vinyl will and it breaks in nicely and gets even more comfortable over time. Leather gets softer over time vinyl gets harder. 4.6 out of 5 stars. Seat covers fit great and were easy to install. Took 2 people to make it fit just right. Price was reasonable for leather. And he couldn't believe how low the price was.. Installed in about an hour. Looks like a great match for my 2004 limited excursion. I added a little extra batting on top of my old cushion so it would not look loose over the 13 year old foam that had compressed a bit. Cover fits pretty good, could be a little tighter, but overall nice fit. Ford does not make this part anymore. Well made, fit fine, no problems, color match was good. Product was very well made, and a perfect match to rest of truck. So much so that I also got the back and arm rest, which were also quality products. Product was fine, color match was great after I c! But it a pain to install took me 8 hours, thank God I found good video on instal. Wish description, included what tools are required for installation. Not everyone has a set of hog ring plier's or a garment steamer. Have used your products before and will in the future. Have several friends interested in them too. Easy to install and fit perfect! Looks to be good quality. The item "2002 -2007 Ford F250 Super duty Lariat Rear Bottom Leather Bench Seat Cover TAN" is in sale since Monday, September 25, 2017.